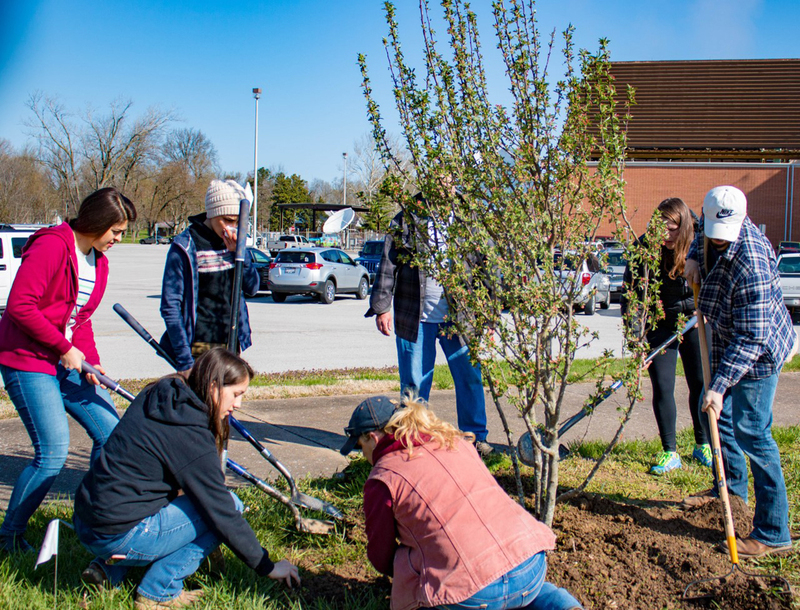 CARBONDALE, Ill. — Salukis are getting greener all the time, and Southern Illinois University Carbondale is recognizing that growing commitment to sustainability in a number of ways during April. The month-long Earth Month commemoration will wrap up April 30 with a big Sustainability Celebration. Throughout the month, a variety of events are planned, including several workshops, a lights out night, the Drawdown Ecochallenge and more. 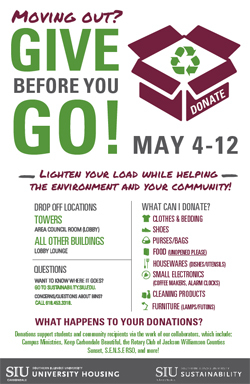 The momentum continues into May with the popular “Give Before You Go!” promotion. One of the highlights is the Eco-Recreation installation set for 11:30 a.m. - 1:00 p.m. on April 25 at the Becker Pavilion on Campus Lake. Three projects will actually be installed on the lake. The goal is to enhance the area and ensure it stays healthy and usable for generations to come. The projects include a prototype of a pedal-powered water pump on a stationary bike that people can pedal to send water to a fountain located along the shoreline. An obstacle course of solar-powered fountains will also be installed. As people paddle canoes and kayaks on the course, they will aerate the waters around the pavilion. Woodcarving sustainable tools workshop – April 12, 5:30 p.m., Student Center Craft Shop. Tree Campus USA tree planting – April 16, 9-11 and noon-2 p.m. meeting on parking lots adjacent to Communications Building. Volunteers will plant pollinators that provide food for beneficial insects. Farm to Fork Dinner – April 17, 5:30 p.m., Trueblood Hall Commons. It’s a professionally prepared meal featuring food grown or produced locally. Reduce and Reuse DIY – April 18, 5:30 p.m., Student Center Craft Shop. Learn to “ditch the plastic” in this fun workshop where you’ll create a simple bag for grocery store shopping and make cling wrap from fabric and beeswax. Lights Out – April 19, 5:30 p.m. across campus. Volunteers will meet and walk through various campus buildings, turning unused lighting off to conserve energy. Numerous other activities, including the annual Carbondale Spring Cleanup on April 13, are planned. SIU is also getting involved in Project Drawdown, a comprehensive plan to reverse global warming, via participation in the Drawdown Ecochallenge. The Drawdown Ecochallenge is a 21-day contest, ending April 24, during which participants take specific actions to help reduce their carbon footprint. Earth Month wraps up with a big Sustainability Celebration on April 30 from 11 a.m. to 12:30 p.m. at Morris Library. The event will feature the announcement of the newest Green Fund grant recipients, the presentation of the Environmental Ambassador awards and more. 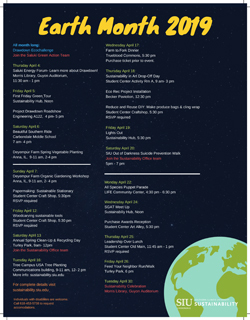 Visit sustainability.siu.edu for the complete Earth Month schedule. Some activities do require pre-registration and there is a nominal cost for some events. 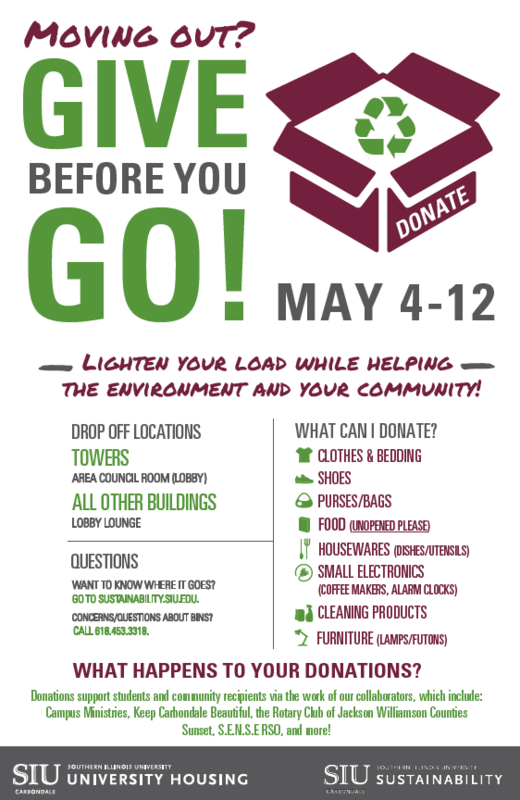 As the semester draws to a close, SIU will once again sponsor the Give Before You Go campaign, encouraging students to donate their gently used items to help others who can use them rather than discarding them, adding waste to landfills. In May 2018, students donated approximately 9,398 pounds of clothing, furniture, appliances, shoes, bedding, towels, kitchen wares, small electronics, cleaning products and other necessities along with 22 winter coats and nearly 1,200 usable food items. University Housing and the Sustainability Office collaborated with other on- and off-campus units and organizations to provide these items to organizations that in turn help area children and community members. Beneficiaries included the Wesley Foundation Food Bank, Saluki Food Pantry, Carbondale Thrift Shop, area teachers, the Carbondale Park District, Freecycle, Carbondale Towers, Night’s Shield, Lighthouse Shelter, Herrin House of Hope, Teach my Kenyan Children and others. This year, donations will be accepted May 4-12. Items can be dropped off in designated spots in the lobbies of various campus buildings. Call 618/453-3318 for more information. Find out more about SIU sustainability online, by calling 618/453-2846 or emailing sustainability@siu.edu.